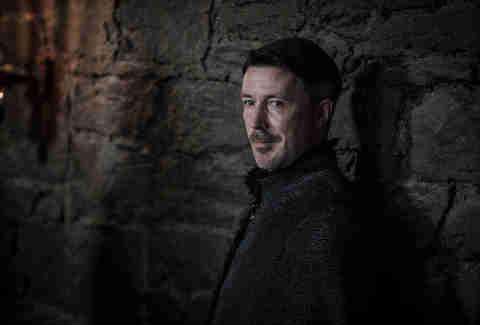 Embodying a master manipulator like Littlefinger on Game of Thrones wore on Aidan Gillen's soul. He needed a break -- to find a character who was just as interesting, but more importantly, a better person. Someone warm. Someone thoughtful. Someone who actually contributed to the betterment of humankind. Gillen found that with his new role portraying real life scientist Dr. J. Allen Hynek, an astronomer and professor who pushed for open-minded scientific explanations for unidentified flying objects and who inspired Steven Spielberg's Close Encounters of the Third Kind. (Hynek has a cameo in the film). 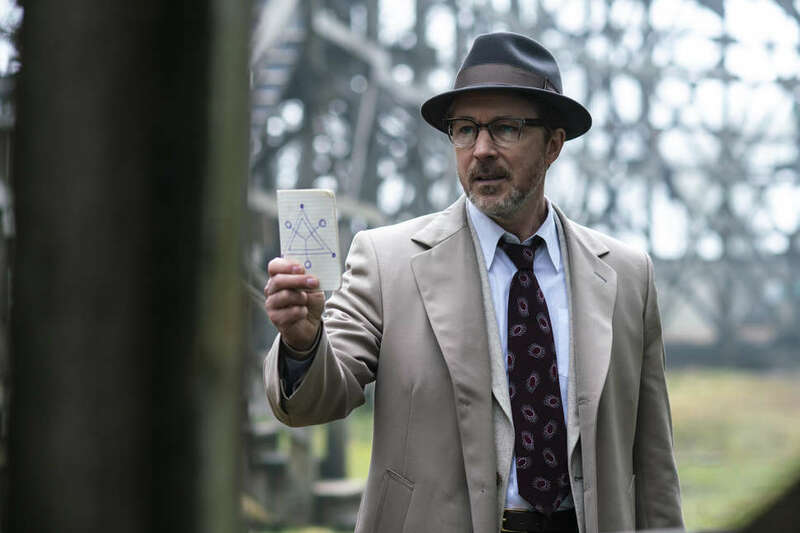 Hynek's top-secret work evaluating UFO sightings for the U.S. Air Force in the 1950s and '60s has since been declassified and is now the subject of an X-Files-minded conspiracy drama on History called Project Blue Book, executive-produced by Robert Zemeckis. Gillen's Hynek has both Mulder's curiosity and Scully's skepticism, which makes him unpopular with the government, which wishes he would just toe the company line and debunk public theories regarding little green men. Gillen took a break from filming the fourth season of Peaky Blinders to muse about the nature of the universe, the oddity of UFOs and Star Wars both existing near his former home in Ireland, and whether Arya might make use of Littlefinger's face for one final, crucial assassination. Thrillist: Where do you stand on the question about life apart from our own in this universe? Do you want to believe? Aidan Gillen: In life apart from our own in this universe? Yeah, I think there is definitely life apart from ourselves in this vast universe, absolutely. But will we make contact in our lifetime? Not for sure. Have we made contact? Not for sure. Will we ultimately? Definitely, almost definitely. And I'm talking about through radio or whatever technologies we haven't developed yet. It's going to happen, sooner or later. The danger is, we might eradicate ourselves, annihilate ourselves here on this planet, before we get a chance to do that. And we've nearly done it a couple of times now over the past hundred years. But there are a hundred billion stars in this galaxy, and there are like 200 billion galaxies in the known universe, and it's almost ridiculous -- no, not almost ridiculous, it is ridiculous -- to think that we're the only planet with life-forms in the universe. There are people who don't like thinking about this stuff. It's more comfortable to stick with what you know, to not put ourselves up against the dangerous things we don't know about. But there are people among us who want to put themselves in that situation. And if you don't have people like Galileo or Carl Sagan or Hynek looking for this stuff, really looking for it, we may never find it. We may never get told about it. So I'm drawn to these kinds of adventurers and seekers and dreamers, even if it's fantasy. Close Encounters of the Third Kind was the first movie I ever saw on my own in the cinema, when I was eleven, I think. I remember it vividly, the whole experience. I was expecting something along the lines of Star Wars, but this excited and scared me at the same time. It was a potent cocktail. A real milestone film for me, for sure. And I'd been watching Carl Sagan’s Cosmos TV program since I was quite young, around the same age. I was as fascinated with him and his real science-based program as sci-fi/fantasy entertainment. I think science-fiction goes hand in hand with technological advances. Why, in the era of people taking video footage of everything, is there not more evidence? Gillen: That’s what Steven Spielberg said. The guy who made Close Encounters of the Third Kind, which was inspired by the Hynek books. Now that we all have smartphones, why do we not have more evidence? Where is it? They were able to solve most of the UFO cases with logic, but it came down to 10% of them being inexplicable. All you need is one case, though, to change everything we know about ourselves and our planet, which is just one little dot in infinity. The first three minutes of Contact tell you the most, when it zooms right out and keeps going, and going, and going, and going from the earth. Robert Zemeckis just kind of reminds the audience of how small we are. Hynek faces difficulty with his discoveries, though, because the Air Force wants him to debunk it. You could draw a parallel with how this administration treats news it doesn't particularly want reported, calling it "fake news." Gillen: Yeah, but there's always been propaganda, you know? The powers that be were horrified when the printing press was invented: “Oh no! The masses are going to be able to find out stuff that we don’t want them to know about.” I don’t like to use the term “fake news,” though. I think it gives it credence, that it is a thing. There isn’t “fake news” and “real news.” There is just news and reporting, and propaganda has always been a tool to try to make people think your way, or not know the truth for your benefit, or for the benefit of the perpetrator or the powers that be. And there was a similar reported sighting off the Irish coast, from British Airways and Virgin Atlantic jets, where they saw a radically moving series of bright objects, like moving really fast, Mach 2, and taking obscene angle turns. They put up the video and audio right away from air traffic control, and they talk about it a quite ordinary way. People are more open nowadays with the idea that, you know, we’re not alone. Plus the chances that it would be a spaceship or an alien craft are highly unlikely. I would have liked to have seen it myself, though. Did you go, "Hey, guys… Let's go shoot an episode about this Irish UFO?" Gillen: Yes! I was trying to convince them to come to Ireland! [Laughs] We all thought it funny and improbable. Is it hard, after shooting Game of Thrones so close to home and in other amazing locations, to have a production based in one spot for such a long stretch? To be in Vancouver? Gillen: Well, we have to be. Because of the nature of shooting this series and the budget, we have really high production values, and they probably wouldn’t be so high if we had to spend all this time going to Ohio or Mississippi or California every week. It would be interesting to go shoots some episodes in Venezuela or Ireland, though. Do you miss traveling to shoot on location? Gillen: I suppose I did get spoiled a bit on Thrones, because most of it was shot in Northern Ireland, and then I got the odd jaunts to Croatia and Iceland. I got to do all those things, and that was a real joy, a real perk. I was happy to be in Northern Ireland, because it’s where I’m from. Well, I’m from Dublin, but it’s an hour up the road. I’m one of those people who always sits on the window seat of a plane. I don’t understand why anyone would ever sit on an aisle, unless they’ve got a severe fear of flying. And then when I arrive, I spend like 20% of my time filming travelogues -- craters, or the waves at the seashore -- on my phone using iMovie with the vintage8 app. If I’m off on a job somewhere, it’s a way to preserve the memory for yourself, or to show people where you are, and you can shoot pretty decent quality film on a phone and add a music soundtrack. I used to use a super8 camera. I traveled all around Mexico for about seven weeks with it, with as many rolls of film as I could afford to bring, but they were each about three minutes each, so you get like 20 minutes of film out of it, and half of it is out of focus. It’s a lot easier now. One of my favorite travelogues, I was living down in rural southwest Ireland on the side of a mountain, and I used to climb it regularly. Some days, you’d just be surrounded by mist and clouds, and it would be really beautiful in one way, but you couldn’t see too much. But other days, it would be the most amazing landscape and vistas that you’d ever seen. They actually shot some of the Star Wars: The Last Jedi there recently. Where Luke Skywalker was living in exile, that’s down near where I used to live. That’s a really stunning area. I just like putting these landscapes together with music. I enjoy the process. Gillen: It’s funny you should mention that, because we did shoot some of that down in Kerry where I was living. Jamie is a good friend of mine, and he’s very familiar with my kind of love of just walking around the countryside, looking at waves. I first met him like 17 years ago, we did this film together called The Low Down, and I thought I was playing him, because he had written and directed it, and he thought I was playing me. I guess that’s when we realized that we were the same person, in a sense? We had a lot in common. It’s just an odd life, the life of an actor, the exposure of it, and a lot of people think they know you, and they kind of do, but the you that they know is made up. And if you’re not careful, you kind of start believing that one yourself. People present different sides of themselves to the world all the time anyway. We all use smokescreens to make our way through the world, and deflect how we’re really feeling about things. So we just thought it was funny. We thought we were making a comedy, and then it got really sad. Perhaps it’s a statement about the cost on your soul to play so many dark parts, but you play a version of yourself, a Method actor, who, in order to play a serial killer, becomes a cereal killer. Are people more careful around you now? Anyone worried you might drown them in a cereal bowl? Gillen: Actually, yeah! [Laughs] Beware of the Rice Krispies. But it is an odd thing to think about, when you think you’ve got to go to work, and you’re like, “I’ve got to strangle somebody tomorrow.” And their psychosis seeps into your subconscious. I was doing a series in Canada about 15 years ago called Dice, and I was playing this manipulative college professor who convinces somebody else to do something really nasty. And I was thinking, “This is really fucked up. I know I’m acting in a scene, but I believe in this, because that’s my job, and it’s just giving me bad dreams.” You know? And you do it because you’re used to it, and because people give you these roles, and because it’s kind of enjoyable, but it does stain you, for sure. After all the killers and creeps and manipulators who were bad for your soul, is playing Hynek kind of a balm for what ailed you? Well, a survivor until that last bit, yeah. But people want to see him again. There are so many fans who want to see him return. Maybe with Arya wearing his face so she can break into the Red Keep and kill Cersei, but still. Gillen: So I’m back now? I put that all behind me! [Laughs] Maybe I’ll just send my face over. She can wear it, literally. Jennifer Vineyard is a contributor to Thrillist.